Background and Objectives: Premature coronary artery disease (PCAD) seems to increase, particularly in developing countries. There are fewer data regarding myocardial infarction in young adults, with varying risk factors and patterns of coronary involvement. This study was done to present the coronary angiographic characteristics of CAD in young patients aged <40 years. Materials and Methods: In this cross-sectional record-based study, patients aged <40 years who were evaluated angiographically for chronic stable angina or acute coronary syndrome were included. Single vessel disease (SVD), double vessel disease (DVD), and triple vessel disease (TVD) were noted down. Onset of CAD before 40 years of age was considered as PCAD. Results: A total of 4526 cases underwent coronary angiogram between January 2008 and December 2014; 154 (3.40%) were <40 years of age with a mean (standard deviation) age of 36.51 (±3.654) years. In <40 years age group, nearly third-fourth of the cases (112, 72.73%) had critical CAD; among them, 98 (87.5%) were male and 14 (12.5%) were female. About two-third of the cases (74, 66.07%) had SVD, followed by DVD (25, 22.32%) and TVD (13, 11.61%). Conclusions: Incidence of critical CAD in young adults is quite high. Young patients with CAD are mainly males, and SVD is more common. Emphasis should be given on diagnosis and management of risk factors in this vulnerable group. Cardiovascular diseases (CVD) and its complications account for approximately 12 million deaths annually in the Indian subcontinent. The Global Status Report on Noncommunicable Diseases has reported that in India, CVD caused more than 2.5 million deaths in 2008. As per 2014 statistics by the World Health Organization, 26% of total mortality in India is contributed by CVD. Mortality due to coronary artery disease (CAD) is higher in South India. Studies carried out in India and other places suggest that Asians in general and Indians in particular are at an increased risk of myocardial infarction at a younger age (<40 years), irrespective of whether they have migrated to other countries or are resident Asians. Heart diseases are rising in Asian Indians and present 5–10 years earlier than in other populations around the world. The mean age for the first presentation of acute myocardial infarction in Indians is 53 years. Onset of CAD before 40 years of age is considered as premature CAD (PCAD)., Incidence of CAD in young Indians is about 12%–16%, which is higher than any other ethnic group., With this in the background, the study was done to assess the incidence of critical CAD in patients aged <40 years who were evaluated for chronic stable angina or acute coronary syndrome (ACS) angiographically. This cross-sectional, record-based study was done in a 450-bedded tertiary care hospital in South India. The study population consisted of all patients who underwent coronary angiogram between January 2008 and December 2014. It was a record-based study in which the details of all such cases were extracted from the case records. Inclusion criteria included all patients aged ≥18 years, who gave written informed consent, presented with ACS or stable angina, and who underwent coronary angiography (CAG) based on the ACC/ESC indications for CAG for the first time., Critical (severe) CAD was defined as critical narrowing (70% or more) of a coronary artery that results in a significant reduction in maximum flow capacity in a distal vascular bed. CAD manifested in <40 years of age was defined as PCAD., Those patients who underwent coronary angiogram in another center were excluded from the study. Those aged above 40 years were also excluded from the study. Diagnostic CAG was performed by a team of expert interventional cardiologists. A detailed analysis of angiographic images was done by the operators. Both eye-balling method and quantitative CAG were used to estimate the coronary lesions. 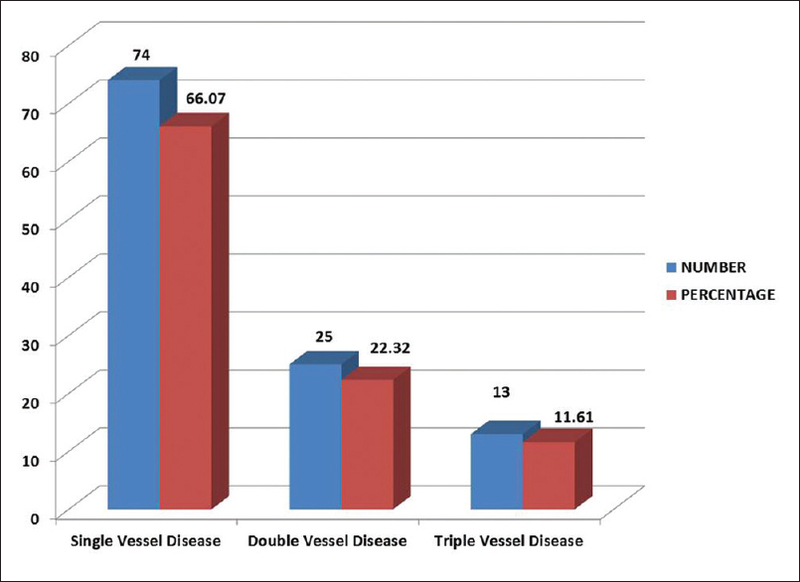 The patients were grouped into single vessel disease (SVD), double vessel disease (DVD), and triple vessel disease (TVD) according to the number of major epicardial coronary arteries involved. Stenosis of the coronary vessels was considered mild when the luminal diameter was reduced by <50%, moderate (50%–70%), and severe/critical (>70%) of the original diameter. A total of 4526 coronary angiograms done during the above period were screened. Data analysis was performed using Microsoft Office Excel 2007and SPSS for Windows, version 20.0. (IBM Corp., Armonk, NY, USA). Continuous variables were calculated as mean ± standard deviation (SD), and categorical variables were presented as counts and percentages. A total of 4526 cases were included in the study, out of which 154 cases were <40 years of age. Out of 154 patients, 112 (72.73%) had critical CAD. The proportion of cases with normal coronaries is 18.18% (28) and 11.11% (14) cases had noncritical CAD [Figure 1]. Out of 112 cases with critic</50%,>al CAD, 98 (87.5%) were male and 14 (12.5%) were female [Table 1]. Among 112 cases with critical CAD, SVD was most prevalent (74, 66.07%), followed by DVD (25, 22.32%) and TVD (13, 11.61%) [Figure 2]. The youngest patient who underwent angioplasty for SVD was 21 years of age, and coronary artery bypass grafting for TVD was 23 years. Among 154 patients who underwent coronary angiogram, 127 (82.5%) were male and 27 (17.5%) were female. The mean age (SD) of candidates <40 years of age who underwent coronary angiogram was 36.51 (±3.654) years. In this study, nearly third-fourth of the cases (112, 72.73%) had critical CAD. The difference in the occurrence of critical (severe) CAD among different age groups was statistically not significant (P = 0.958). However, there was a statistically significant difference between males and females (P = 0.001) [Table 1]. 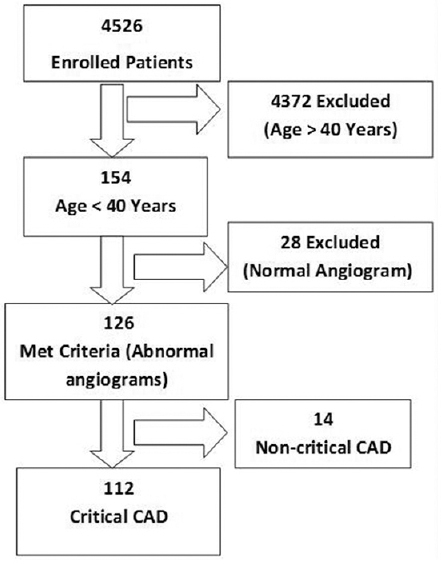 In a study from Poland on angiographic characterization in CAD patients aged <40 years, the mean age in the study group was 35.1 ± 4.4 years and men made up 86.2% of the study group. Angiographically, normal coronary arteries were found in 16.9% of patients diagnosed as ACS. SVD in CAG was seen in 61.9% of patients with positive result of CAG (stenosis >50%). The significant atherosclerotic coronary lesions mainly affected the left anterior descending (LAD) coronary artery (61.6%), followed by right coronary artery (RCA) (27.4%). In a study from Bangladesh, 38% of patients <40 years of age had normal coronary arteries and 4% had noncritical coronary lesions. In another study from Nepal, SVD (58.3%) was the most common finding in CAG and 7.6% patients had normal or nonobstructive coronary lesions. In this study, about two-third of the cases with critical CAD had SVD (74, 66.07%), followed by DVD (25, 22.32%) and TVD (13, 11.61%). LAD was the most common vessel involved (60), followed by RCA (52), left circumflex (41), and left main. In another study from South India, majority of the patients (57.14%) had SVD which was seen on CAG, followed by normal coronaries (22.45%); 16.3% had DVD and 4% had multivessel disease. In consistence with Badran et al., Ahmed Hussein, and Christus et al.,,, the present study also found higher rate of SVD among PCAD. There are a few main limitations to this study. First, only patients who presented with symptoms and posted for an angiogram were diagnosed with CAD. Second, this was a single-center study. Hence, the results cannot be generalized to the community. No data on risk factors of patients are collected and analyzed. This is a retrospective study of data collected from the case records, and the details of bifurcation lesions and ostial lesions could not be extracted. Nevertheless, this study identifies and scrutinizes a large sample size to investigate the prevalence of PCAD and provides valuable information regarding the magnitude of the problem. Incidence of critical CAD in young adults is quite high. Young patients with CAD are mainly males, and SVD is more common. Emphasis should be given on diagnosis and management of risk factors in this vulnerable group. Gupta R, Guptha S, Sharma KK, Gupta A, Deedwania P. Regional variations in cardiovascular risk factors in India: India heart watch. World J Cardiol 2012;4:112-20. World Health Organization. Global status report on noncommunicable diseases 2014. Geneva: World Health Organization; 2014. Yusuf S, Hawken S, Ounpuu S, Dans T, Avezum A, Lanas F, et al. Effect of potentially modifiable risk factors associated with myocardial infarction in 52 countries (the INTERHEART study): Case-control study. Lancet 2004;364:937-52. Sharma M, Ganguly NK. Premature coronary artery disease in Indians and its associated risk factors. Vasc Health Risk Manag 2005;1:217-25. Prajapati J, Jain S, Virpariya K, Rawal J, Joshi H, Sharma K, et al. Novel atherosclerotic risk factors and angiographic profile of young Gujarati patients with acute coronary syndrome. J Assoc Physicians India 2014;62:584-8. Siddique MA, Shrestha MP, Salman M. Age related differences of risk profile and angiographic findings in patients with coronary heart disease. BSMMU J 2010;3:13-7. Mammi MV, Pavithran K, Abdu Rahiman P, Pisharody R, Sugathan K. Acute myocardial infarction in north Kerala – A 20 year hospital based study. Indian Heart J 1991;43:93-6. Task Force on Myocardial Revascularization of the European Society of Cardiology (ESC) and the European Association for Cardio-Thoracic Surgery (EACTS); European Association for Percutaneous Cardiovascular Interventions (EAPCI), Wijns W, Kolh P, Danchin N, Di Mario C, Falk V, et al. Guidelines on myocardial revascularization. Eur Heart J 2010;31:2501-55. Levine GN, Bates ER, Blankenship JC, Bailey SR, Bittl JA, Cercek B, et al. 2011 ACCF/AHA/SCAI guideline for percutaneous coronary intervention: A report of the American College of Cardiology Foundation/American Heart Association Task Force on Practice Guidelines and the Society for Cardiovascular Angiography and Interventions. Circulation 2011;124:e574-651. Shah I, Faheem M, Shahzeb, Rafiullah, Hafizullah M. Clinical profile, angiographic characteristics and treatment recommendations in patients with coronary artery disease. J Pak Med Stud 2013;3:94-100. Maroszyńska-Dmoch EM, Wożakowska-Kapłon B. Clinical and angiographic characteristics of coronary artery disease in young adults: a single centre study. Kardiol Pol 2016;74:314-21. Tamrakar R, Bhatt YD, Kansakar S, Bhattarai M, Shaha KB, Tuladhar E. Acute myocardial infarction in young adults: Study of risk factors, angiographic features and clinical outcome. Nepalese Heart J 2013;10:12-6. Sricharan KN, Rajesh S, Rashmi K, Meghana HC, Badiger S, Mathew S. Study of acute myocardial infarction in young adults: Risk factors, presentation and angiographic fi ndings. J Clin Diagn Res 2012;6:257-60. Badran HM, Elnoamany MF, Khalil TS, Eldin MM. Age-related alteration of risk profile, inflammatory response, and angiographic findings in patients with acute coronary syndrome. Clin Med Cardiol 2009;3:15-28. Ahmed Hussein AM. Coronary artery disease in young versus older adults in hilla city: Prevalence, clinical characteristics and angiographic profile. Karbala J Med 2012;5:1328-33. Christus T, Shukkur AM, Rashdan I, Koshy T, Alanbaei M, Zubaid M, et al. Coronary artery disease in patients aged 35 or less – A different beast? Heart Views 2011;12:7-11. Enas EA, Dhawan J, Petkar S. Coronary artery disease in Asian Indians: Lessons learnt and the role of lipoprotein(a). Indian Heart J 1997;49:25-34. Mohan V, Deepa R, Rani SS, Premalatha G; Chennai Urban Population Study (CUPS No.). Prevalence of coronary artery disease and its relationship to lipids in a selected population in South India: The Chennai Urban Population Study (CUPS No 5). J Am Coll Cardiol 2001;38:682-7. Goel PK, Bharti BB, Pandey CM, Singh U, Tewari S, Kapoor A, et al. A tertiary care hospital-based study of conventional risk factors including lipid profile in proven coronary artery disease. Indian Heart J 2003;55:234-40.